Americans are now becoming more aware that the corrupt deep state has burrowed into the federal government in a manner never seen before. But the deep state will ultimately be destroyed because of one major thing they underestimated. The deep state never counted on the massive silent majority of Americans who have not and will not ever give up on Trump or America! While the mainstream media (MSM) focuses on the fake news Trump-Russia collusion farce, the US is engulfed in the most corrupt event in its history and all roads lead back to former President Obama. As a matter of fact, the fake Trump investigation is a major piece in the attempted coup d’état currently in place and the MSM’s fake news reporting is part of the Coup. Bolton is right. This is the biggest challenge to the survival of the country since the Civil War. Democrats in the 1860’s would rather break up the Union than accept the election of the first Republican President, Abraham Lincoln. Today’s Democrats would rather remove another Republican President, Donald Trump, from office than accept the results of the 2016 election. Democrats in the 1860’s broke up the Union because they didn’t want to give up their power over the executive branch of government and they didn’t want to end slavery, Democrats today are partaking in their Coup D’état because they don’t want to give up their power over the federal government and don’t want to be put in jail for their crimes committed in the years before the election. The Obama Administration and the deep state, those individuals in government that have created crimes and continue to commit crimes to support their cause, don’t want President Trump to change the destructive direction in the US. The Obama Administration did all it could to destroy this great nation and hand it over to the world of global elites. President Trump and the Americans that voted for him want to save America and the world by standing for freedom, life, human rights and the pursuit of happiness for all Americans. The US is at a crossing point. This started long before the 2016 election. The Obama Administration was the most corrupt group of villains in the White House ever. They were involved in numerous crimes and corrupt dealings and efforts to destroy America including covering up their decision not to save four Americans in Benghazi, lying about Obamacare, doubling the US Debt with nothing to show for it, trading the Taliban 5 for a traitor, creating ISIS, giving 20 percent of US uranium to Russia (Uranium One), etc. The list goes on and on. Then during the 2016 election the Obama Administration took a fake dossier to the FISA court and used it as a means to spy on their political opponent during the election. We now know that the dossier was as fake as a National Enquirer article created by a company known to create nasty, made up accusations against individuals for a significant payout. This dossier was then taken by the FBI to the FISA Court to obtain approval to spy on candidate and now President Trump. We know that every request to the FISA Court during Obama’s last four years to spy on Americans was signed by former Attorney General Lynch. We also know that Obama’s dishonest spy Chief James Clapper said he knew of every FISA request that was requested and also that no FISA warrants could have been issued without President Obama knowing. We also know that only 1 in 10,000 FISA requests were turned down by the court and this was the first request made by the Obama Administration to spy on Trump. Obama then apparently used the fake dossier to obtain the warrant on Trump. We also know that the entire FISA court was Obama appointees in May of 2016, about the time the court the approved Obama’s request to spy on Trump. The MSM criticized President Trump for these tweets but now we know he was right. Towards the end of the election Democrats started their propaganda campaign that Trump was in cahoots with Russia. Most Americans knew it was nonsense because they voted for Trump. We don’t know if this was created to protect the Democrats from being caught spying on Trump using known bogus claims, to change the narrative away from their crimes with Russia (Uranium One) or to set Trump up for kangaroo charges after a projected Hillary win. Regardless, as soon as the election was over, Obama’s deep state went into action. Deep State got their man at Attorney General, Jeff Sessions, and immediately neutered him. 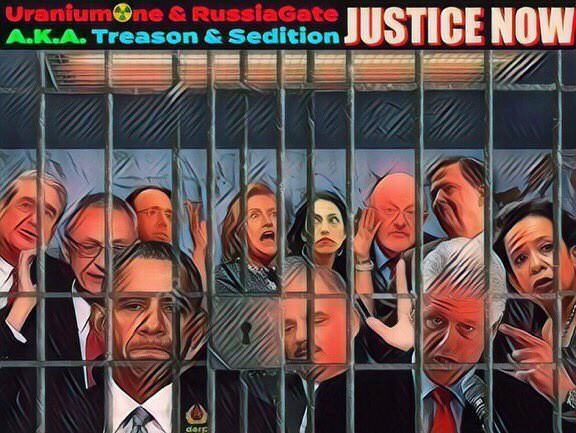 They next got deep state operative and corrupt Assistant AG who immediately created a special counsel to look into fake Trump-Russia collusion. The investigation was not based on US law and the man appointed to lead the investigation was none other than Robert Mueller. We reported in August this year that Mueller is a dirty rotten cop. He was strategically placed in the position of Special Counsel to investigate the Trump-Russia fake news story by his former partner in crime Assistant Attorney General Rod Rosenstein. He brought in a team of individuals that are all partisan hacks that worked for the corrupt Clintons and Obama administration. Mueller is also close friends and partner in crime with the man who replaced him at the FBI, James Comey. In spite of this relationship, and Comey’s obvious involvement in the case, Mueller will not recuse himself from the Trump investigation. The entire investigation is not even based on US law and the Mueller team continues to break the law by leaking information to the press related to this fake investigation. It’s even plausible that the entire investigation is in place to allow Mueller and his team the ability to destroy information related to their past criminal actions. Now however the deep state’s initiative to take over the country is beginning to fail. They like so many corrupt entities before them went for too much. Thanks to entities like Judicial Watch that are uncovering documents that show the corrupt and criminal actions of deep state and due to diligent reporting from entities like this one (TGP) and Hannity, Breitbart, FOX Business and others, and the efforts of a few honest congressmen, the deep state is being shown for what it is. Numerous corrupt and criminal actions are being reported daily, not by the MSM, but by the new media. We are growing in numbers and respect as the days go by while the fake news Trump-Russia collusion reporting MSM is being abandoned by truth seeking Americans. Read more at TGP.